There’s no “end all, be all” way to visually map the customer journey, so long as the ultimate outcome is a deep understanding of your customer’s feelings and experience. Customer journey maps are often mistaken for other diagram-like deliverables, but the common differentiator is the uncovering of empathetic and emotional insights. The real value extends beyond the poster deliverable to the identifying and sharing deep customer insights that can be used to inform high-level strategies as well as detailed campaigns and tactics. Let’s start with an understanding of journey maps. Quite simply, a journey map is a framework to capture a customer’s experience with your organization (from their perspective) across a series of touch points. The goal is to identify their unmet needs and pain points, the emotional factors that influence decision-making, and opportunities to improve the customer experience. We call these Moments That Matter™. The complete customer experience isn’t comprised of a single touch point; rather, it’s a culmination of engagements and experiences throughout their journey. Let’s use a healthcare example. If you ask a doctor, nurse, or case manager about the patient’s experience they can likely give an accurate depiction of their unique interaction. However, in isolation that misses pivotal moments – a patient researching a condition and finding a provider; booking an appointment; the front desk interaction; or even what we call “the space between” – those times between provider interactions where a lot of unmet needs are happening (such as late night anxiety over a pending procedure). It’s critical that your journey maps can account for all of these experiences. There are many ways to visually map the customer journey, and there’s no “right way” – so long as the end result is a deep understanding of your customer experience shortcomings and opportunities. What They’re Doing: What are the patient’s key processes and actions/interactions along their journey that shape their experience? Examples include researching a condition, requesting an appointment, and visiting the doctor to name a few. People: Their Real Social Network: Whom does the patient interact with at each phase of their journey and how does that impact their emotion? This can be as obvious as the doctor-patient interaction or as private as a meeting with a pastor or a neighbor watching their dog during treatments. What They’re Thinking: What is the patient’s thought process throughout each phase of the journey? How They’re Feeling: How does the patient feel across the various touch points? By uncovering their feelings, we can find opportunities to ease fears and concerns or magnify satisfactions. They’re Pain Points: Are there unresolved problems, real or perceived, across the journey? Unmet Opportunities: What solutions may help to resolve pain points and increase patient satisfaction at critical touch points? This is the culmination of insights and gets us to our goal – how can we improve the overall experience. Ultimately, how do we preserve what you are doing well while improving the journey in both simple and innovative ways. 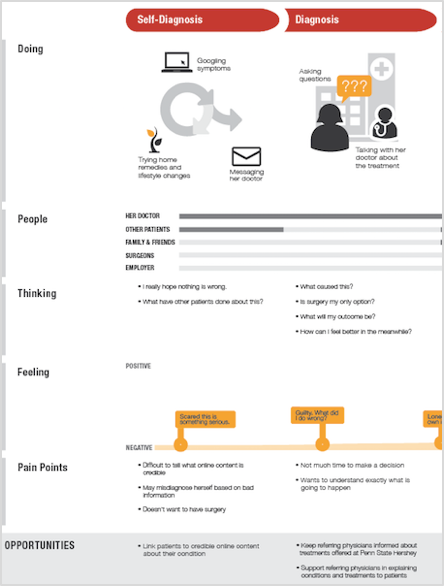 We know what a patient journey map is. So, what is it not? As journey mapping becomes mainstream, it often gets mistaken for other “diagram-like” outputs such as process diagrams and channel inventories. But they’re not. That’s not to say that these other deliverables aren’t valuable because they all serve a business purpose. Where journey maps generally differ is in the added emotional component that really helps us get to how people “feel” by peeling back the layers of customer experience. Those feelings are often not just what drives satisfaction scores but what influences their design to try or maintain a healthcare relationship. Process Diagram A flowchart or picture of the separate steps of a healthcare process in sequential order – including but not limited to defining the entity, steps in the service process, and responsible parties. They don’t take into account critical emotional and human factors like how someone is “feeling” or what they’re “thinking” at each process point. Touchpoint Map A visual map of the brand’s points of customer contact – including every encounter a customer has (or could have) with an organization. It doesn’t account for emotions or “the space between”, where a customer isn’t directly interacting with the organization but their thoughts, feelings or concerns affect their satisfaction (e.g. : in between appointments). Workflow Diagram A visual way for your business analysts to show how work gets accomplished – depicting the flow of tasks or actions from one person or group to another. It’s a possible outcome of journey maps but not the basis of them. Journey maps are more about capturing the customer experience. In a work setting, that would be the employee’s “experience” of task flow. Channel Inventory An outline of marketing and communications channels. Although channels can be dimensions of journey maps, it’s more about how the customer interacts, thinks and feels across those channels. What makes a journey map so valuable? At Red Privet we like to say: “It’s about the process, not the poster.” The poster output is at best an executive summary of what we learned from journey mapping, but it truly is about more than the pretty pictures and flow diagrams. It’s about the deep, rich, wide-range of information uncovered while learning about the patient’s journey. The real value is in sharing that with organizational stakeholders. That makes journey mapping a powerful investment. The poster is just a cool rallying point for marketing teams. >> Read Part 2: How to Approach Your Project – In this blog, we discuss considerations to keep in mind as you embark on a new journey mapping project.